Issue 13, unlucky for some perhaps... as the big reader poll results come in, and we start to make the changes, additions and omissions that you've asked for. 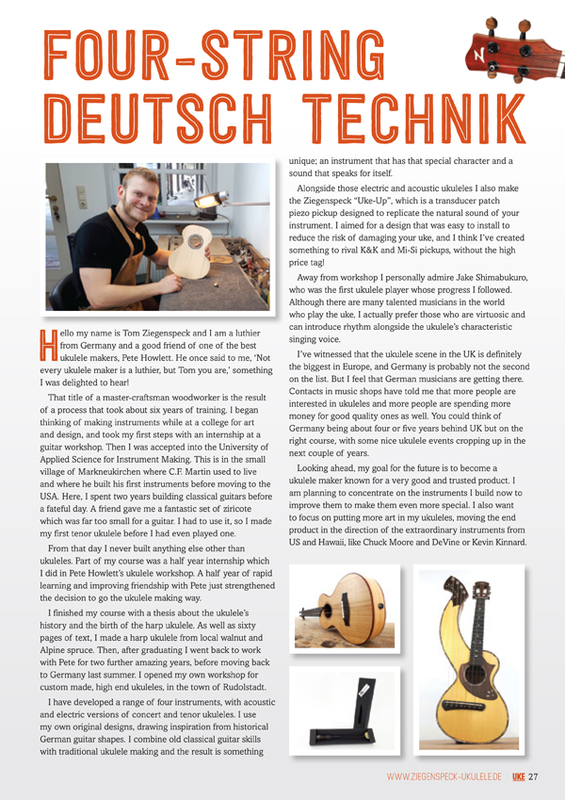 One constant though, is an absolutely packed UKE Magazine, full of ukulele stars, techniques and tales, with a global outlook but UK focus. Taking our questions is Andrew Molina, the Hawaiian star, on the eve of his first visit to Great Britain. He's joined by fresh, energetic band, Cousin Earth, as they talk about their 'Prog Uke' project. There's an interview with Leisa Rea from the Ukulele Orchestra of Great Britain, a discussion with Rigk Sauer, the boss of Risa ukuleles, and Phil Doleman share's all his best technique and practice tips. For those with an eye on the next big thing to hit uke shops, there's a selection of electro-ukuleles that break the mould assessed in focus, plus a look at what's inside Opera-lele's gig bag. And that's just the tip of the Uke-berg! The Hawaiian star talks about the family tradition of making music and his excitement about visiting the UK for the first time. Fancy a dose of high-energy ukulele prog-rock? Ukulele shredding solos, tight harmonies, thumping beats, booming bass? You need some of Brooklyn’s Cousin Earth! We tap into Phil Doleman’s incredible experience as a teacher and performer to tease out some tips we can all learn from. A pioneer of electric ukuleles, Rigk Sauer talks to us about how a shortage of materials led him to develop the quirky and popular Uke Solid. One man, one ukulele, played brilliantly. Peter Moss talks about touring the world to display his playing talent.